The history of the Faculty of Economics and Administration (FEA) at the University of Malaya, the oldest faculty of economics in Malaysia, is inter-twined with the history of the nation of Malaysia. In response to the nation’s push for economic development, from modest beginnings in 1966, FEA has been growing from strength to strength. With remarkable agility, it has responded to changes both locally and globally. In fact, changes at FEA have also closely reflected the changing economic landscape of the nation. 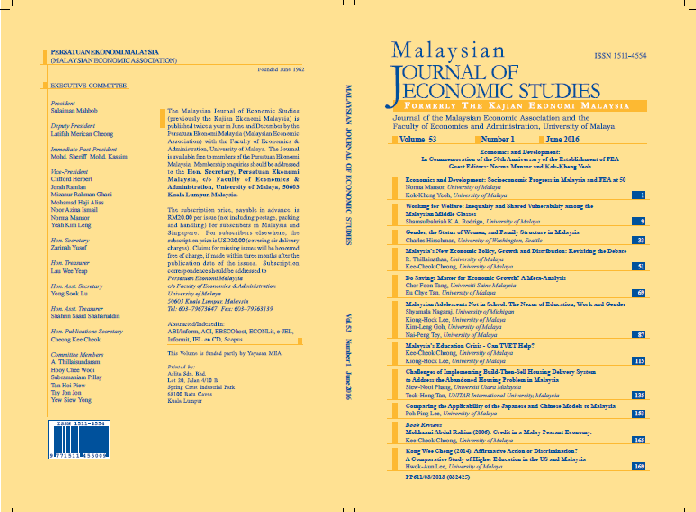 This special issue of MJES in commemoration of the 50th anniversary of the establishment of the faculty contains nine contributions on various topics and issues pertinent to Malaysia’s socioeconomic development since independence. MANSOR, Norma; YEOH, Kok-Kheng. Economics and Development: Socioeconomic Progress in Malaysia and FEA at 50. Malaysian Journal of Economic Studies, [S.l. ], v. 53, n. 1, p. 1-8, june 2016. ISSN 1511-4554. Available at: <https://mjes.um.edu.my/article/view/2776>. Date accessed: 24 apr. 2019.